Well it is definitely winter now in Sydney, though I really can’t complain as we’re going to be blowing this popsicle stand soon for a more tropical location. In the meantime though, I needed a way to entertain the little bears one afternoon and baking was the way to go. 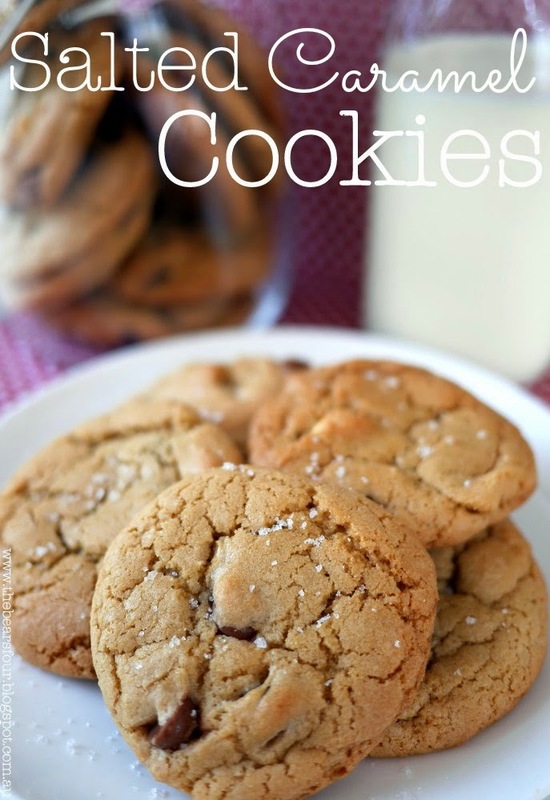 We made these Salted Caramel Cookies and they were so good I had to share. Step 1: In a mixing bowl, mix together the flour, corn flour, baking powder, baking soda and salt. Step 2: In another mixing bowl, using an electric mixer, mix together the butter and sugars. Once light and fluffy add the vanilla extract and eggs and mix until incorporated. Step 3: Add in half of the flour mixture and once mixed in, add the second half of the mixture. Step 4: Pour in the caramel chips and mix by hand. Step 5: Scoop out about a rounded tablespoon of cookie dough for each cookie and place it on a grease proof cookie tray. Bake at 170 degrees Celsius fan forced for 10 minutes. Step 6: Once out of the oven, sprinkle fleur de sel on top of the cookies.